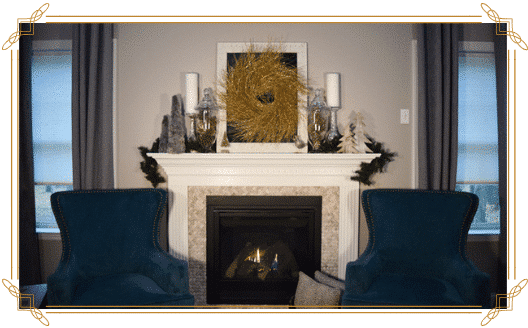 From the strategic balance of decor to the final flick of the switch that adds natural gas warmth and ambiance, UGI has provided an easy, six-step guide to making your mantel look professionally decorated for the holidays and all year round. The Anchor, or focal point, of your design is generally placed at the center of your mantel. Usually this is the largest object and might be a mirror, a canvas, a wreath, or even your TV. Here, we’ve spiced up our mirror anchor by hanging a wreath in front! The Weight refers to objects flanking the anchor to balance your design visually. They should be the second tallest objects in the space and about the same size, if not identical. We’ve selected tall pillar candles, but other examples are lanterns, vases, globes, lamps, or floral arrangements. Your Layers create depth within your design and should overlap your anchor when possible. These can be symmetrical or asymmetrical depending on your taste. We’ve used large apothecary jars filled with decorative pinecones. Small signs, family letters, or baskets would also work. Pull your look together by adding filler across your display. We chose to weave a small section of evergreen garland throughout our display to enhance the festive feel. Draping seasonal greenery – available at your local craft store – also works well as filler. 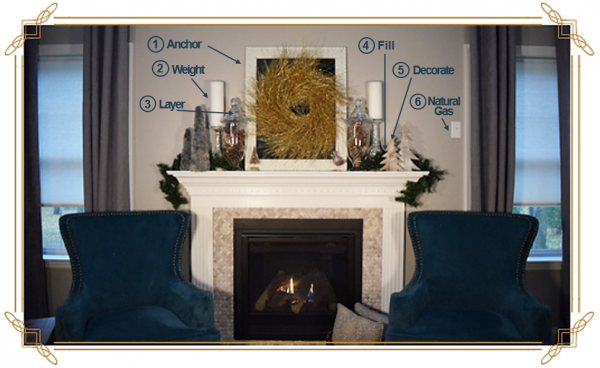 Add objects of varying heights throughout the display to prevent creating any horizontal lines throughout your mantel. Keep scale in mind as you select these items. We’ve added seasonal trees and a winter bird as decor in our example. Last – but not least! – be sure to flip the switch to natural gas in your fireplace this winter to enjoy instant-on ambiance and warmth at the flick of a switch! No mantel in your house? You can use the same technique on a large floating wall shelf or buffet table! 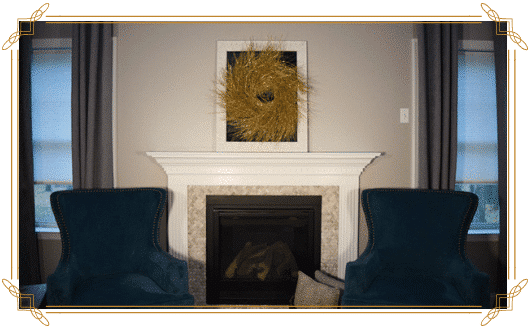 To learn more about natural gas fireplaces, click here.